Dawg, I really believe that all the buildup of the soil is critical; but to really beat the southern nematode you need to add grafting or planting hybrid varieties that have strong nematode resistance. I hate to add to your woes but as you are in the very southernmost part of Georgia you will or do have fusarium. If you are ever all the way over on the other side of the state in the spring or anytime I have grafted plants then hop on over into Alabama and I will give you a few to try out. I use a variety of root stock that has good nematode resistance, great fusarium resistance and so far excellent resistance to Bacterial wilt which you may not have had the pleasure of dealing with yet but you will. 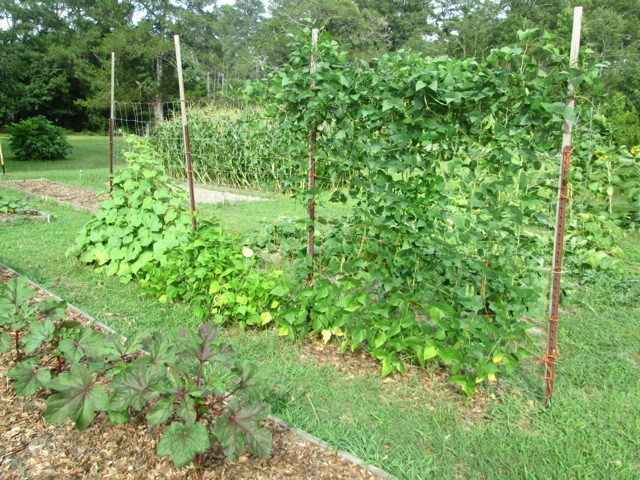 Despite all the buildup of my soil I still get nematodes to one degree or another in my cucurbits and okra. There is just no escaping the buggers down here unless you want to do what Marsha does and even then just one little area where they can enter from the bottom and they will get in your pots. I know because I actually had it happen a couple of times when I was trying out container growing trying to get away from the nematodes and fusarium. Total truth. You need a solid barrier between the soil and the pot. I use the thick plastic from my PromixBX bales under my pots. If you are ever all the way over on the other side of the state in the spring or anytime I have grafted plants then hop on over into Alabama and I will give you a few to try out. I use a variety of root stock that has good nematode resistance, great fusarium resistance and so far excellent resistance to Bacterial wilt which you may not have had the pleasure of dealing with yet but you will. I really appreciate the offer. I'm in east central Georgia (Augusta area) and have to thinnk long and hard for the last time I was in Alabama. Certainly nothing against Alabama but I just don't travel much. But if I do, I'll take you up on the offer. There is just no escaping the buggers down here unless you want to do what Marsha does and even then just one little area where they can enter from the bottom and they will get in your pots. The potted tomatoes are away from the garden (up by the house) and are on pallets. So far I've had no problems with them. Looking back, I really think my nematode problems began when I had a load of top soil brought in as I was converting the garden to raised beds. Before then I had not one bit of nematode problems over years. Ok...a little background first. My Patch consists of 9 wire cages...24"X 5' tall. I grow 3 tomato plants around the outside of each cage. This years' varieties were Big Boy (3), Big Beef (6), Early Girl (6), Chef's Choice Pink (3), Delicious (3), Sioux (3), and Cleota Pink (3). The 2 that are infected are Delicious and Early Girl. The other is Big Beef. Can I sterilize the infected areas? I'm considering dumping some bleach in there and digging out/relocating the dirt and starting with fresh soil next year. Any thoughts? I have been dealing with them for 40 years in the same garden spot. Building up your soil with lots of organic matter and mulching heavily is probably the best thing you can do for your soil but it takes time to reduce their numbers. Nematodes thrive in dry sandy soil which is what happens when most of the organic matter is used up. I have tried the bleaching thing and since I am a proponent of using it for certain disease issues it doesn't work too well in the soil. At best it helps for a couple of weeks but then things move back in and the bad things move back in faster than the good things. A friend of mine who is a chemist and a gardener uses the diluted bleach spray when he has problems on his tomatoes but thinks that using it in the soil could be detrimental to the soil due to salts forming as the bleach reacts in the soil. Your best bet for long term nematode fighting is to use resistant varieties but even they can sometimes be affected if the problem is bad enough. Those roots in the first picture look like my cucumbers and squash did when I pulled them a week or two ago. Man, I'm sorry to see those roots. Once you have them, you have them. From all that I've read, you can knock them back to a point where the damage isn't as great for a season but they'll be back. Personally I have planted and tilled in marigolds, mustard and Sunn hemp, tilled fallowed beds periodically in the hottest part of summer, used resistant plants, tilled in leaves to improve soil and added what compost I have when prepping the planting holes. Rinsed all tools with water to remove soil when done for the day and sprayed them with 10% bleach solution. I have read several times that application of diluted molasses can temporarily reduce nematode populations but dilution rates vary a lot. U of Mississippi was experimenting with that. This fall I'm going to leave the infected beds fallow and plant spring brassicas and green peas there in January/February while the soil is cold. Since nematodes are inactive in cool soil and only wake up when soil temp gets above 65, the plants will finish before the roots get too damaged. Then I'm going to starve the little boogers for the rest of the year. (See Fallowing and Rotation paragraph). Here in south Florida, I grow in 15 and 20 gallon containers. I use ProMix for my potting mix and amend with cow manure. You can also add French marigolds to the pot and also 1/2 cup or 1 cup of alfalfa pellets to the mix. It makes a big difference in my over all RKN infestation. Put thick plastic, like Marsha said under the pots does help as well. Make sure you use only french marigold and 100% alfalfa pellets..not store bought rabbit food. Alfalfa has triacontanol which is a growth stimulant and it's released in the soil like a steroid for your plants..RKN do NOT like this chemical. Use the entire marigold plant...leaves, stems and roots. I do this for all my tomatoes, peppers and okra, cucumbers in the spring. Alfalfa has triacontanol which is a growth stimulant and it's released in the soil like a steroid for your plants..RKN do NOT like this chemical. Thank you for this info. I will have to experiment with this. I have also read that alfalfa pellets added to the compost pile help speed up the process. This merits a call to our local feed 'n weed store this morning to check out what they have. Thanks to all of you for your replies and advice. I'll do more research based on what y'all have given me and come up with a plan to deal with these buggers.... I tend to take it personally when something messes with my tomatoes. Thanks again; I'll keep y'all updated. 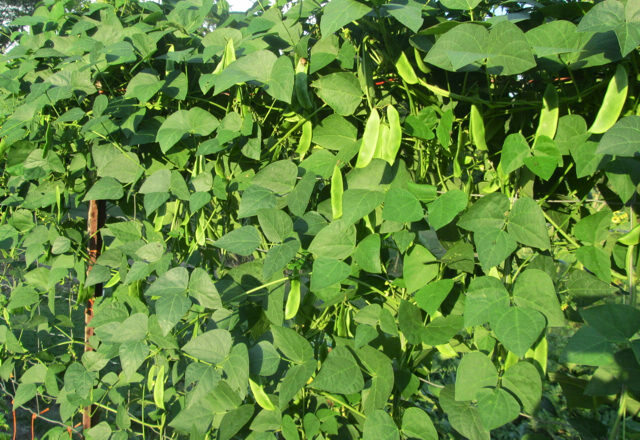 ... and on July 6, actually filling out pods. I was shocked. To have so much infestation and yet no wilting of the vines, no discoloration and actually producing. They were planted end of April after the soil had warmed up good. Could it be that they are resistant? Next spring I might have to plant some in a known infected bed to test that. BTW, the limas were very tasty too. I just discovered this summer that I've got them too. I knew something was up when summer 2nd and 3rd planting of squash and beans refused to grow and just died. 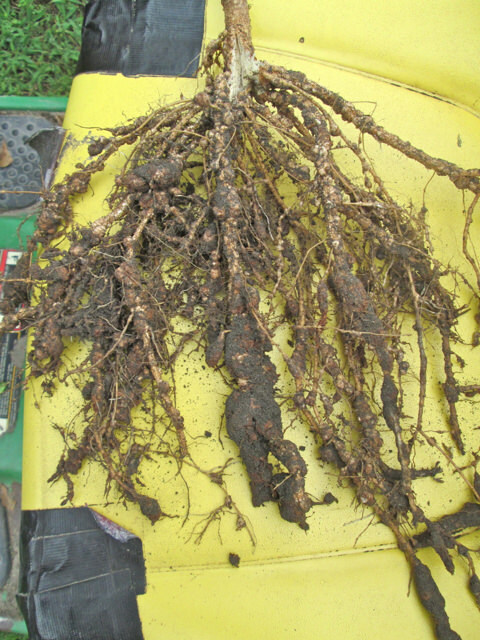 Here are Roma bush bean roots with RKN. I imagine they make it through the composting process so likely I've been spreading them that and other ways all along. Make sure you clean any tools that have been in that soil if you also have unaffected areas. I wash the soil off mine with a strong hose stream and then spray them with 10% bleach solution before putting them away. If it's a clear day I also set them out in the sun as the hot metal will kill any eggs that might escape the bleach. I wonder if we could multiply beneficial nematodes in a vermiculture like fashion? Feeding them with grubs we find and other hand picked garden insects. Thanks for the link. That's quite an impressive list of victims. And "grow your own" nematodes. Grow some in a box of soil, take some out to treat a bed and replace the removed portion with fresh soil. I wonder how long it takes them to reproduce. It could work if we knew that. I'm also wondering if just treating specific beds would keep out fliers like cucumber beetles who would come and go. I calculated an average coverage area of 417 sq ft which would cover about six of my sixteen beds. I'd have to do "grow your own" to afford treating them all plus open areas!